Nolaro24™, LLC's Foot Type Classification Method is the first of its kind, custom-to-foot type orthotic system. The QUADRASTEP SYSTEM® is based on founder Roberta Nole's 24 patented foot typing methodology, identifying 6 major foot categorizations. Each of these 6 major foot categories represents a sub groupings of 4 foot types. These 6 subgroups are referred to as "Quads", the derivative of the name "QUADRASTEP SYSTEM®". These Quads are both letter (A through F), and color coded to reinforce product branding. Users of the system can now, through simple observation of a patient's foot in standing, identify a person's QUADRASTEP SYSTEM® Foot Type in less than two minutes. For the first time ever, patients can walk into their practitioners' office and leave within minutes with comfortable, high quality, custom to foot-type orthotics. 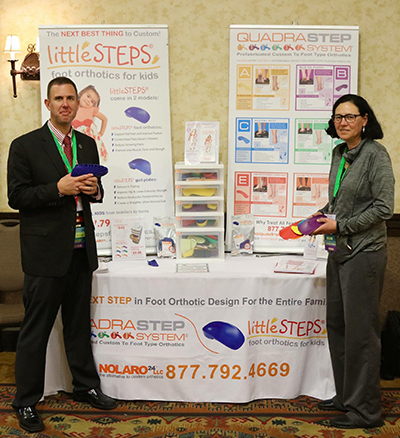 In 2010 Nolaro24™, LLC added to our product line with the revolutionary new pediatric orthotic solution, called littleSTEPS®. littleSTEPS® are pre-fabricated foot orthoses specifically designed for kids. They deliver prescription based correction closely matching the criteria of traditional UCBL devices, enabling early intervention and treatment of many musculoskeletal conditions common to children, particularly developmental flat-foot. littleSTEPS® orthoses are specifically designed to improve coordination, balance, pain, posture, strength, and aid in the development of a more stable and functional gait. Sizing ranges from a toddlers size 5 through a Youth/Adult size 8.5 (euro sizes 21-42), suiting all children. In 2014 Nolaro24™, LLC added our popular littleSTEPS® Gait Plates to our product line. littleSTEPS® Gait Plates are the first semi-rigid prefabricated orthoses that effectively limit in-toeing caused by rotational deformities of the lower limb. Left untreated toe-in gait may impair proper development of the lower limb and lead to permanent structural, strength, balance, and coordination deficits. littleSTEPS® Gait Plates work by utilizing a semi-rigid shell that effectively alters the break of the ball of the foot during propulsion to encourage realignment of the hip in gait. littleSTEPS® Gait Plates further address foot pronation which is typically associated with childhood gait abnormalities by incorporating the features of a functional foot orthosis (i.e. deep heel cup, medial rearfoot posting and skive) to control subtalar joint pronation during contact and midstance phases of gait. littleSTEPS® Gait Plates fit children from a Toddler size 5 to a Youth size 5.5, taking children from first steps through teen years. Roberta Nole has owned Stride™, Inc. Custom Foot Orthotics and Stride Physical Therapy and Pedorthic Center, PC, since 1989, specializing in biomechanical gait examination and rehabilitation of the foot and ankle. In 2008 she founded Nolaro24™, LLC (Middlebury, CT) along with co-owner Louis J. DeCaro, DPM. She is a graduate of the University of Scranton (B.S. 1982); the University of Connecticut (M.A. Sports Medicine, 1984; and, B.S. in Physical Therapy, 1994); and received her training in Pedorthics at Northwestern University through the Board for Certification in Pedorthics (1992), now currently credentialed by ABC (American Board for Certification in Orthotics and Prosthetics). Roberta is the inventor of the 24 foot-typing algorithm that is the basis of the QUADRASTEP SYSTEM®. She is a published author in Orthotics & Prosthetics in Rehabilitation, Butterworth and Heinmann, Boston, 2000. Roberta has developed several educational training programs, both basic and advanced level, which are based on her original technology. She teaches and lectures nationally and internationally on her foot classification methodology, including the utilization of visual weight bearing assessment and video gait analysis. She is a member in good standing of the American Physical Therapy Association, and the Pedorthic Footwear Association. Louis J. DeCaro. DPM is a Podiatric Physician who specializes in pediatrics with a special interest in sports medicine and biomechanics for both adults and pediatrics. Dr. DeCaro is President of the American College of Foot & Ankle Pediatrics (ACFAP). He also shares a patent on foot types. He is in private practice in West Hatfield and a member of the surgical & medical staff at Franklin Medical Center as well as Holyoke Medical Center. Dr. DeCaro is the Director and originator of the Adult & Pediatric Gait Labs Biomechanics Clinic, which takes place biweekly at his West Hatfield office. It is a multidisciplinary clinic, which evaluates the most challenging of biomechanics patients, and helps to find them answers through orthoses and therapy. Dr. DeCaro is an international lecturer on the topics of podopediatrics and biomechanics. Please visit decaropodiatry.com or email me at louisdecaro@decaropodiatry.com for further information and/or questions. Kylie Pearce is an Australian trained Podiatrist and a US trained and Certified Pedorthist, with the American Board for Certification in Orthotics, Prosthetics and Pedorthics, Inc.
Kylie graduated from Curtin University, Western Australia in 1994 with a degree in Podiatry and has over 12 years experience in private Podiatry practice in Australia. At one point she owned 4 practices in Australia and employed other Podiatrists and is an experienced Podiatry mentor and public speaker. Her area of specialization is Biomechanics and functional foot orthoses. Kylie has been working part-time with the QUADRASTEP SYSTEM® since February 2013. At Nolaro24™, LLC we are dedicated to educating practitioners and clinicians on our REVOLUTIONARY QUADRASTEP SYSTEM®. We offer two courses to help you become familiar with the QUADRASTEP SYSTEM® Method of Foot Typing. Both courses are approved for continuing education units. We also offer 2 new 1.5 hour webinars in a Biomechanical Series to cover each quad and age group more in depth. Nolaro24™, LLC has recently add a new Master Class, a 2 day class aimed at assessment, fitting, dispensing & marketing orthotics in your practice. For more information on our educational opportunities, visit out EDUCATION page. Nolaro24™, LLC is on a mission to help educate people worldwide about the revolutionary 24 Foot Typing System. Roberta, Louis and Kylie travel the globe in an effort to reach out to practitioners, offering them both products and education. Through this effort we have gained distributors in the United Kingdom, Ireland, Canada, Japan, China, Australia, Hong Kong, Malaysia, and The Cayman Islands. We are garnering interest from other coutries as well, and we hope to be adding to this list on a regular basis! For a list of Distributors in your country, please visit our Distributors Page.